With ROXY, function and technology are the basis of an impressive aesthetic. The striking, slim stainless steel bars are complemented by elegant mesh coverings and high quality table top materials. Multiple tables are available to match the two armchairs. The great extendable table with ceramic top is available with one (23-311 E) or two (23-312 E) additional extensions. One special option is the ceramic table 23-300 E with a fixed tabletop (not extendable). You can order this table in customized lengths between 100 and 300 cm. 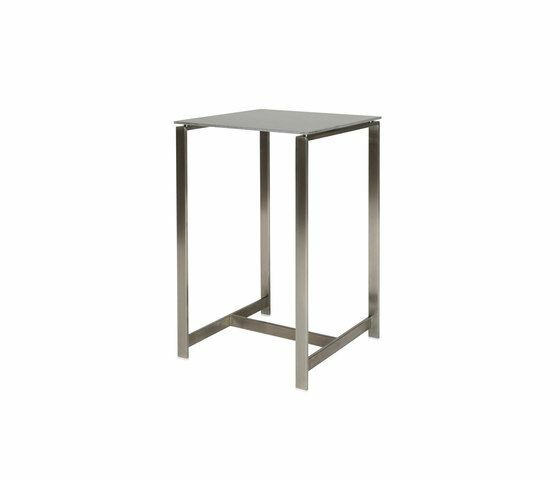 Three additional tables are available with glass table tops (taupe or white) in the following fixed dimensions: 100 x 100 cm, 165 x 100 cm and 215 x 100 cm. ROXY – an excitingly shaped sun lounger made of stainless steel with mesh covering in silver-grey or off-white. The dynamic and ideal curve guarantees a relaxed reclined position. Small wheel rollers help in moving around the stackable lounger. ROXY – clean lines and compact proportions. The models made from flat, precision-ground high-grade steel profiles have a strict architectural appearance. But the thick cushions with the decorative cord edge signify it: Whether a storm or just a gentle breeze – the seat stays remarkably comfortable. RAUSCH CLASSICS, a Karlsruhe/Germany based internationally active company with long tradition develops, designs and produces high-quality furniture for outdoor und spa areas.